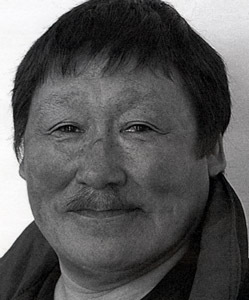 Born in 1943, in Tasialuk, near Puvirnituq. At the age of nine, Iyaituk made his first carving, a sculpture of his parka without a person in it (Myers [Mitchell] 1987:8). He continued carving, in part, in order to feed his family (his four elder siblings died from starvation and exhaustion in the hunt for food). “One day, when I was about 14 years old, I realized that, if he [his father, Markusie Iyaituk] died, there would be no one to help me. I would have to be able to support myself” (Iyaituk in Myers [Mitchell] 1988:67). Sculpture; Iyaituk carved soapstone, bone, and antler. On the subject of how he worked, Iyaituk told Marybelle Myers [Mitchell]: “I prefer working with larger stone because you can create more from your imagination and there is more room to put what you imagine in the stone. You have more room for detail. . . . I prefer to quarry my stone because it’s easier for me to carve. Also, since I quarried it myself and brought it back, all the work that I’ve done is mine right up to the end result” (Myers [Mitchell] 1987:7). Women engaged in domestic chores and bears. As Iyaituk told Marybelle Mitchell: “What I see around me is what I carve. I have seen many bears, but I don’t carve the actual bear; I carve the feel of the bear. I wouldn’t want to carve from a live model; I carve from my head” (Mitchell 1998:43). Iyaituk’s work has been described as “imaginative realism,” a phrase that captures its large-than-life quality. In an interview with Marybelle Myers [Mitchell] in 1998, he said, “There’s a big difference in how you handle the big ones and the small ones. The big ones feel better in my hands. I like to carve something that will not move away when I put more force on it” (Myers [Mitchell] 1998:43). In spite of working with large forms for his human subjects, Iyaituk paid close attention to detail. His female figures, in particular, often exhibit anguished faces. It is an example of how he treated his human subjects with more seriousness than the animals he carved, which “rely on simple lines with a minimum of detail” (ibid.). Iyaituk’s sculpture, Bear, was sold at The Spirit of the Wild, a World Wildlife Fund auction in 1982. It was later presented to the Duke of Edinburgh. A carving of a bear was presented to one of three outstanding players in the CFL Grey Cup football final in 1989. His carving, Nanook, received an honourable mention at the Scottsdale Native American Indian Cultural Foundation’s fourth annual fine art show in 1990, and he took home top honours in La Fédération des Coopératives du Nouveau-Quebec’s annual carving competition in 2004. I remember one incident in particular. It was after the [Ivujivik] co-op started. The other carvers were much better than I was, and once my carvings were sent back from the Federation [the distribution agency for Nunavik cooperatives] with a note saying that I was being paid too much and the quality of my work wasn’t good enough. Here we were, in the co-op with a lot of men sitting around a table where my carvings were displayed, and they were saying that I was getting paid too much and the quality of my work was poor. It was embarrassing for me. . . . I felt that it shouldn’t be this way. ‘I’ll try again,’ I thought. ‘I’ll outwork these people who embarrass me.’ And because I took a new approach, my work improved to the point that it is now superior to the work of those people who had questioned my ability to produce good work (Iyaituk in Myers [Mitchell] 1987:9). 1987 The Swinton Collection of Inuit Art, curated by Darlene Wight, Winnipeg Art Gallery, Manitoba. 1985 Die Kunst aus der Arktis, curated by Maria von Finckenstein, Department of Indian Affairs and Northern Development, Gatineau, Quebec and Mannheim, Germany. 1984 Takamit – Canadian Eskimo Art: Selections from Private Collections and the Government of Canada, curated by Mary Craig and Peter Murdoch, La Fédération des Coopératives du Nouveau-Quebec, presented at the Jane Voorhees Zimmerli Art Museum, Rutgers University, New Brunswick, New Jersey. 2006 “Nutaraaluk Iyaituk,” Inuit Art Quarterly (IAQ), vol. 21, no. 1 (Spring): 42.